Step Inside This Stunning, “Penthouse”, Corner Unit With Killer Views of Mountains & Trees, in Sought After South of Main SOMA Neighbourhood Concrete Constructed “Metrovista”. 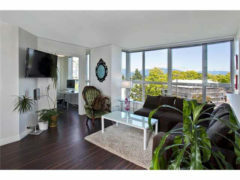 This Beautifully Updated 1Bed & Den, 658SQFT is flooded with light Thru Huge Windows & gives off amazing vibes. Lovingly cared for by long-term owners, a “Top Floor Unit” Because of Terraced Roof, Only 1 Neighbour Beside You! A Hip & Happening Community & Enjoy New “Mount Pleasant Community Centre” Next Door. Tons of Shops, Great Restaurants, Transit, Dog Park, Community Garden, and Starbucks 100 Metres away. Offers a Gym, Meeting Room, 1 Secure Parking (with tons of visitors spots), Huge Storage Locker, Pets & Rentals Welcome!